Dry bulk owners could do well from learning a scrapping lesson from their container cousins, analysts at Alphabulk have posited in their latest weekly report. Alphabulk joins a range of analysts calling for far more urgent and greater volumes of bulkers to be sent for recycling now if the supply/demand balance is to return to the beleaguered sector. However, Alphabulk warned demolition alone will not be enough to restore the equilibrium. “If we compare the demolition age in the dry bulk segment with what is hap-pening in the tanker and the container markets, we can perhaps take some comfort from developments in the container market,” Alphabulk noted in its latest market report. 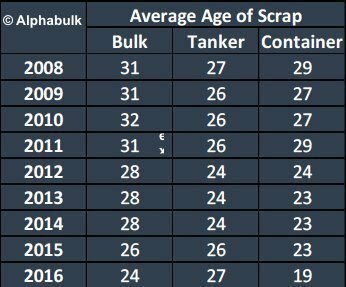 It carried a table, published below, which showed that last year the average age of containerships heading for scrap was just 19, while dry bulk ships were on average 24 when they were demolished. Torching bulkers of 19 years and over would see between 6% and 19% of the fleet disappear, depending on the segment, Alphabulk suggested. “Thus, bearing in mind that there is probably another 10% of extra capacity hidden in the market as a result of large portions of the fleet carrying out slow steaming, we will leave it to the reader to draw his or her own conclusions on whether demolition alone can bring a turnaround in the market,” the report concluded. In its year-start markets briefing global shipowning body BIMCO maintained it is vital 30m dwt of ships are scrapped this year as there is a serious influx of new tonnage coming in from Asian yards this year and next. “This is not a tall order in theory, but the slowdown in scrapping seen since June 2016 causes alarm bells to ring,” BIMCO noted. BIMCO expects the supply-side to grow by around 1.6% in 2017, as compared to 2.2% last year. Clarkson Research noted last week that capesize demolition has declined by over 50% year-on-year in tonnage terms with 2.1m dwt reported scrapped in 2017 so far. “The improvement in freight rates in the dry bulk market in 2017 so far has been sufficient for owners to continue trading their older vessels,” Clarkson Research reported, suggesting bulker demolition is likely to remain “muted”.